Our Community Hall is getting some tender love and care this summer. 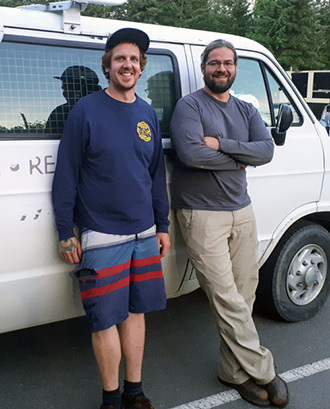 Winmar, a Nanaimo restoration company, is doing the renovations and Arian Scott (of Waypoint Projects—plumbing, heating and water treatment) and Ryan St. Pierre are the local tradesmen contracted to do the plumbing and electrical work. You can visit Waypoint Projects facebook page here. The Hall will be mostly out of commission as Ryan and Arian do their work, but for booking inquiries in August-September and beyond, contact Tsiporah. See our Hall Rental page for more. Our Hall will be open to host one of Gabriola’s signature summer events, the 63rd Annual Salmon BBQ on August 11. Tickets are available here on our website, and at North Road Sports and Colleen’s.